Fisher-Price Thomas The Train Wooden Railway Christmas Crossings Just $7.99! Was $30! You are here: Home / Great Deals / Amazon Deals / Fisher-Price Thomas The Train Wooden Railway Christmas Crossings Just $7.99! Was $30! Today only 11/25/16, Amazon is offering savings on select Toys from Mattel & Fisher-Price including great deals on Thomas the Train items. 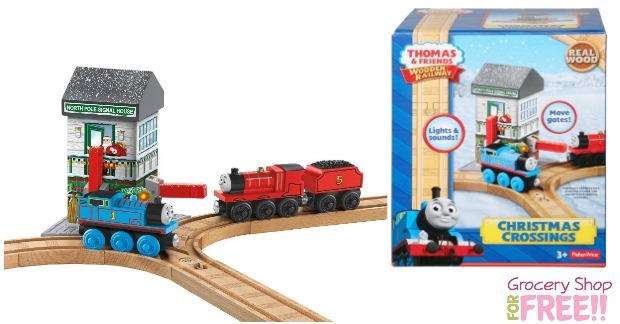 You can get this Fisher-Price Thomas the Train Wooden Railway Christmas Crossings for only $7.99, normally $30! Thomas & Friends Wooden Railway engines don’t just have friendly faces; they’re built to last. These are wooden engines your child can play with for years to come! And with robust, constructive playsets, these pieces will become a fun, beneficial part of your little engineer’s childhood and development (sold separately and subject to availability).